The Outer Loop began in a dim corner of a Newport News, Virginia diner. On a small stage surrounded by wrought iron bars, Jason Helmintoller (guitars, vocals) and Matt Thomas (bass, vocals) played live for the first time. Together they planted the seeds of a unique, winning sound. 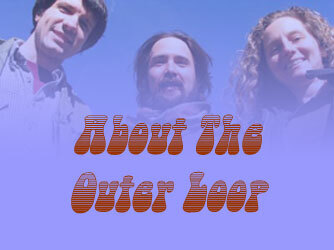 Early on, The Outer Loop twisted the traditional rules of rock to their liking. Thomas' razor-sharp, unpredictable acoustic bass lines fill a lead role while Helmintoller's frantic, precise guitar fills the rhythmic gap. They began writing original material straight away, producing early classics like "Never Said She Didn't" and Thought Train". Even in the early stages, the Loop boys managed to turn heads with their musical magic. They created a fan base of loyal, passionate fans that remain true to the Loop today. Jason Helmintoller is the yin to Matt Thomas' yang. They first played together in various local bands such as Bully Girl and the Battered Husbands. Those bands didn't create sparks, but the chemistry between the two musicians was undeniable. They simplified their instruments and let their songwriting take on a new complexity. Helmintoller's songs are folky sing-a-longs reminiscent of Cat Stevens. Thomas' tunes are more nervy, punk-influenced compositions. Between the two young men, they seem to have an endluss supply of songs guaranteed to stick to one's cerebral cortex like gum to a hot sidewalk. The Outer Loop spent time at Wintersound Studios recording "Who's On the Ceiling? ", their self-released, debut album. The CD has been warmly received and culminated in a front-page Sunday article in the local newspaper, The Daily Press. Drummer Rhonda Piasecki entered the picture in the fall of 2003. Her bluesy brand of rock completes the trio. Now The Outer Loop has been playing gigs all over Hampton Roads and beyond. They performed nearly every weekend during the summer of 2003, and have an even stronger calendar lineup for 2004. Great things lie ahead for The Outer Loop. Together they have forged a great reputation and dedicated fan base. Like a true loop, Jason, Matt, and Rhonda encompass all that came before while simultaneously looking out into the future. They are "here for your benefit". They are The Outer Loop! and you can be entertained for free. Money back money back money back money back money back guarantee.